Your Own Company Logo and Design here. 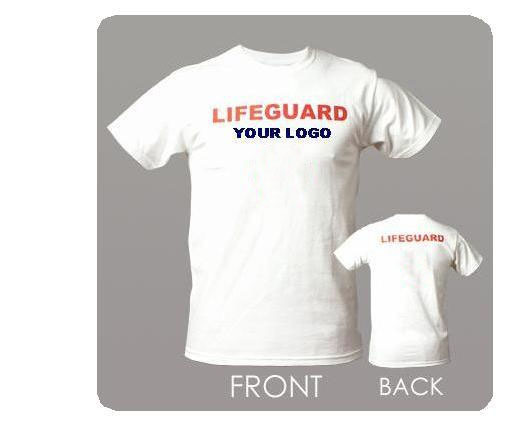 Want your company logo on a Lifeguard Shirt? We do that here. Want to put your design on a shirt? We do that. Or want to get rid of our design and put whatever image you like? We do that here. No minium or maximum. Purchase just 1. Or 12. Or 500 shirts. Whatever Quantity you Like. Price for your own specialized shirt is $39.95 for the first shirt. And $19.95 for each additional shirt with your same design. Your Logo can be placed anywhere on the shirt. We can leave on our cross. Or take it out. We can leave on our "LIFEGUARD" lettering or take it out. The shirt will be designed to your imagination. Process is fast, easy, and high quality. E-mail: MyLogo@LifeguardShirt.com and tell us what you would like on the shirt and where. And what color. Receive your Shirt(s) in 2 weeks. Need Lifeguard Uniforms for your staff? Want your custom logo on a t-shirt, we do custom shirts here. We will provide you with your lifeguard apparel and clothing needs.